Rebecca daisies bring the summer sunny feel to your gardens more than any other flower. The blooms of the Rebecca daisy can grow in many different sizes and may have singular, double, or even triple layers of petals. The shape, size and colour vary depending on the verity. Although The Rudbeckia is the official name, I've always known this flower as the Rebecca daisy but other people used many names like; Brown eyed Susan, Black Eyed Daisy, Brown Betty, Brown Daisy, Bull's Eye, Golden Jerusalem, Poor Land Daisy, and Yellow Daisy. 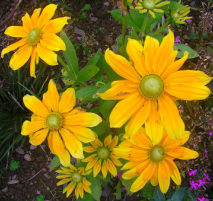 "Irish Eyes" Rudbeckia "Rebecca daisy flower"
- The “Irish Eyes” has Golden yellow flowers with bright green cones. - The “Autumn Colors” has bronze petals, red rings, and rusty red cones. 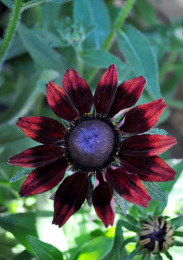 - The “Denver Daisy” has golden flowers with rusty red rings, and central brown cones. - The “Cherry Brandy” has soft cherry red flowers it is a newer variety. 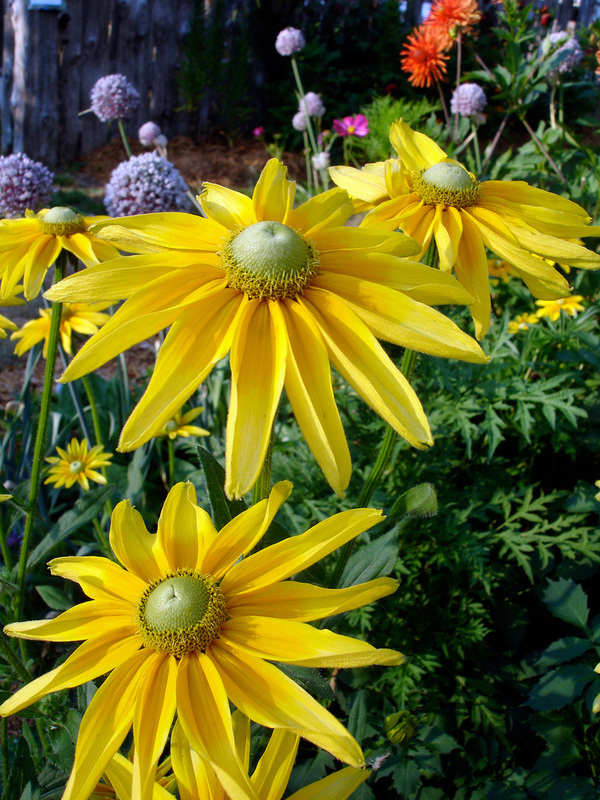 - The “Prairie Sun” has giant deep yellow blooms with light yellow tips and green eyes. 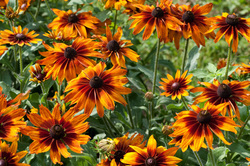 “Orange Fudge” Rudbeckia "Rebecca daisy flower"
Planting a Rebecca in your garden is like planting a surprise flower; you will never know the exact shape or the colour shade you are going to have. They can easily seed themselves if allowed, and may turn out to look different than the original plant depending on other varieties located in your neighbourhood. They can grow 2 to 4 feet in height and some may need to be supported in case of heavy rain. They are drought resistant and can be grown between 5 -10 zones. The Rebecca daisy is a perennial which is also heat and drought resistant. Birds, honey bees, bumblebees and butterflies love this beautiful bright flower, it is very therapeutic to sit close by and watch all the activity going on around your Rebecca garden. You may one year plant a Rebecca somewhere in your garden only to realize the next year that the original plant had died and the seedlings have found themselves a much more desirable location near a rock. Many plants love to be planted near rocks because the water collects underneath and stay moist while the rest of the ground is dry during the summer heat. Placing rocks in your gardens can also be very decorative and appealing to the eye. Rocks come in so many different colours they may even have a metallic shine that will accentuate the looks of any garden. Rocks also add minerals to the soil keeping your plants healthy and happy. You can buy rocks or boulders at a landscaping company or look for them when going hiking, taking a walk by a river or finding them in your backyard. It is best to plant Rebecca Daises in the spring time, but if you need to transplant a Rebecca or any other plant during the summer heat, try to surround the base of the plant with flat rocks to keep it from drying up quickly. It would also be best to provide the plant with shade from the sun for few days in order to recover. Rebecca Daisies are summer bloomers; once they start they keep going until the end of the summer. If you have never had a Rebecca before, you must try them. Choose a sunny location where you can see them from your window. They will never disappoint you and I guarantee that they will be your favourite for many years to come.